From energised rocks in the middle of the Aussie Outback to spooky hotels a la Stephen King, the homes of famous vamps to off-the-beaten track groves of malformed trees in the depths of Slavic Europe, this list of the world’s most mysterious places to visit is sure to have something to pique the interest. No matter if you’re a conspiracy theorist, a dedicated UFO hunter, a proponent of the Nosferatu, a medium, or a supernatural buff – or even if you just fancy heading away from the tourist trail for something a little different- there should be plenty to be getting on with. Some spots are perfect places to indulge those weird and wonderful interests in the otherworldly, others will have you jumping out of your skin. Some are just awesome places to travel to, while everything here promises mystery by the bucket load. Tales of lost mariners and disappeared ships, crashed aircraft and even vanishing humans, have been emerging from the waters of the Bermuda Triangle for centuries. 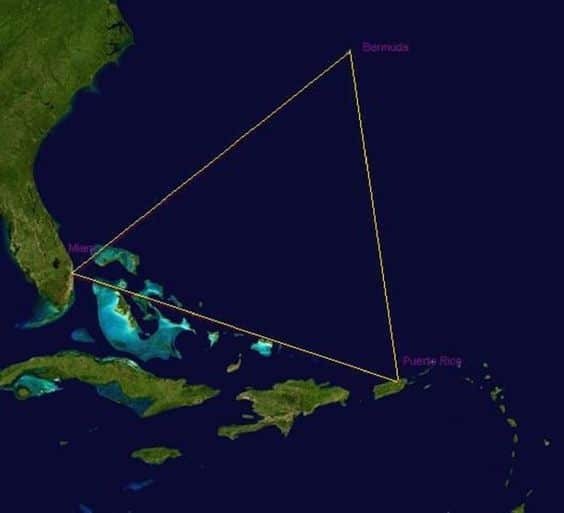 The vast area of more than half a million square miles is also known as the Devil’s Triangle, and theories as to why so many travelers fall foul of its clutches abound. Some say there are magnetic anomalies that throw compasses off course, others that tropical cyclones are to blame, and some say there’s simply no mystery at all! Today, visiting the area can be much more pleasant than you might think, with the sun-splashed islands of Turks and Caicos beckoning in the south and the coves of Bermuda in the north. You may actually want to never be seen again! With overtures of the Timberline Lodge of Stephen King and Stanley Kubrick’s The Shining fame, the Banff Springs Hotel of Canada is said to be the home of a plethora of ghost stories and mysterious happenings. Locals tell tales of an entire family that was murdered in cold-blood in room 873. Others talk of reappearing doormen who vanish into thin air. But if you think you can deal with the supernatural rep, then you’re in for a real treat here. The handsome hotel oozes Scottish Baronial styles, is shrouded by the fir-dressed peaks of the Canadian Rockies, and offers access to the iconic ski fields of Jasper and Banff. Worth the risk? We think so! Sylvan hills and mist-topped mountains, the clanging echo of church bells and the stone-built medieval steeples of towns like Sibiu, Brasov and Cluj, all add to the eerie atmosphere of this vast region at the very heart of Romania. But it’s one place that really brings the chills and gets the spine a-tingling: Bran Castle. This turret-topped citadel soars from the forests on the edge of Wallachia in a medley of Gothic towers and gargoyle-peppered roofs. Over the years it’s been associated with a number of less-than-savoury, uber-mysterious figures: Vlad the Impaler, the most bloodthirsty of the Wallachian kings, and – of course – Count Dracula, the archetype of the nail-biting Nosferatu. Just south of the unpronounceable city of Szczecin on Poland’s extreme eastern haunch, a stone’s throw west of the border with Germany, a small clutch of just over 400 pine trees has been garnering the attention of Atlas Obscura types and off-the-beaten-track travelers for years. 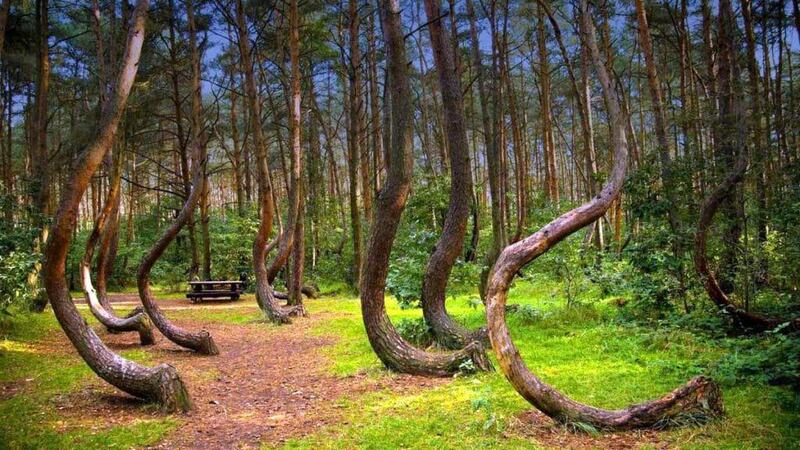 The entire forest appears to be bent over almost 90 degrees at the trunk, before twisting back straight again and growing vertically into the Slavic sky. Debate has raged as to what caused the unusual wood to come to look like it has, with theories as wide ranging as torrential snowstorms and lumberjack growing techniques. Enfolded by the rises of the Aravali Hills and baked by the Rajasthani sun, the old bulwarks of the Bhangarh Fort are said to echo with the ethereal presence of one cursed princess and her would-be captor, the wizard Sinhai. It’s said that Sinhai tried to ensnare the young royal by offering her a love potion. The plan backfired, the wizard ended up dead, but not before he could lay his hex on all the inhabitants of Bhangarh. Today, the Mughlai complex once trodden by Madho Singh I is considered one of the most haunted spots in India. No one is allowed to enter after dark, and locals have even reported deaths as a result of the continued curse! 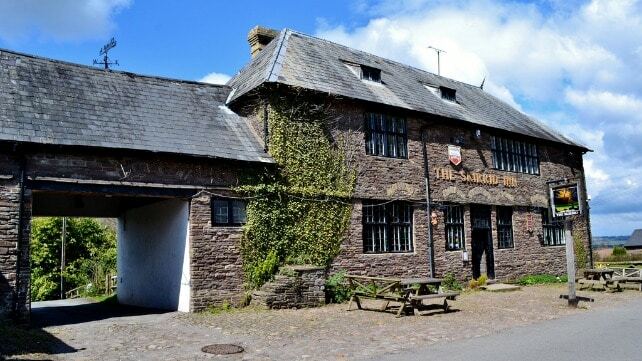 Set between the rising fells and lichen-spotted stone villages on the eastern edge of the beautiful Brecon Beacons National Park (Wales’ lesser-known, southern mountain range), The Skirrid Mountain Inn oozes with tales and stories of the Gaelic nation’s past. Some say it was the gathering point of rebel fighters under the banner of Owain Glyndŵr, the hero of Welsh resistance against Henry IV. Others claim that it was once a courthouse where criminals were not only condemned to death but also hung, all under the command of the infamous so-called Hanging Judge, George Jeffreys. There’s even a swinging noose still dangling from the rafters inside, and oodles of ghost stories to hear over your cawl (traditional Welsh soup)! The beheading of kings, the incarceration of state enemies, the plotting of political machinations from the Tudors to the Elizabethans; all manner of dark and shady deeds has gone down between the crenulations of London’s old fortress on the north bank. Stories of hauntings and mysterious happenings began with the sighting of Thomas Becket (a martyred saint), who is said to have stymied construction of the palace’s extension from the grave. However, it’s the apparition of one Queen Anne Boleyn that causes the biggest stir – her headless body is seen lurking by the spot where she was killed at the behest of Henry VII back in the 1530s! Delve into the winding walking trails that crisscross the Chestnut Ridge Park and discover the hidden wonder of Shale Creek. Called, appropriately, Eternal Flame Falls, this curious natural phenomenon is a real mystery to behold. Why? Well, because it manages to fuse two of the earth’s most elemental forces in one single spot – that’s why! You’ll first see the gorgeous falls themselves, cascading down over layers of chiselled granite rock. Then comes the flame, which can be seen flickering behind the cataracts. It never goes out, and scientists say the conflagration is created by the presence of natural gas seeping from the subterrane. Seemingly swirling and spinning and twisting like a cyclone through the heart of the mighty Sahara Desert, the great Richat Structure in the depths of Mauritania is something truly mysterious (although you’ll certainly have to take to the skies to see it!). Scientists have puzzled for years as to how the perfect circular set of concentric rings got there. Some think it was an asteroid impact in centuries gone by. Others say it was the simple process of natural geological attrition and erosion. And then – of course – there are some who think it was the creation of extra-terrestrials, who passed this way and marked a landing point for future visits to earth. Scarring their way across the dusty desert landscapes of southern Peru, the Nazca Lines are amongst the most mysterious and awesome prehistoric remains in all of South America. And while they typically take a backseat to the country’s other major tourist draws – Machu Picchu, The Sacred Valley, Cuzco – they do draw in their fair share of visitors. Most opt to do flyovers and see the great wonders from above, which is when the curious geoglyphs depicting spiders and monkeys come into full view. Now a UNESCO World Heritage Site, no one really knows why they were made by the ancient Nazca people. Perhaps they were an offering to the gods? Perhaps they were a cultist symbol? It’s still a mystery. If you choose to navigate the crawling vines and ivy shoots, the looming oak trees and the lichen-spotted tombstones of London’s Highgate Cemetery, then beware: this is considered by many to be the single most haunted place in the United Kingdom (Tower of London omitted, of course). The setting is certainly enough to curdle the blood, with age-old angelic figures hiding amidst the shadow growth, gargoyles laughing from the crevices, and endless rows of tombs running into the distance. Some ghost watchers say they’ve seen apparitions flitting between the Gothic carvings. Others report vampires lurk in the shadows there. A magnet for conspiracy theorists like no other place on this list, Area 51 has inspired UFO hunters and extra-terrestrial buffs for years – it even featured in Roland Emmerich’s alien-rich masterpiece Independence Day back in 1996! Located smack bang in the midst of the Nevadan desert, the site has been kept top secret by the United States government since it began developing reconnaissance and spy planes back in the 50s. Today, speculators think it could be anything from a public surveillance hub to a weather control station to a time travel station. Don’t expect a visitor’s center or anything, but then Vegas is just down the road! It was just at the turn of the first millennium AD that the Rapa Nui peoples of eastern Polynesia landed and began surveying the wind-blasted shores of Easter Island. Of course, it wasn’t called Easter Island then – the name is a later European addition courtesy of the Dutchman Jacob Roggeveen, who happened upon the land in 1722. What he discovered would have surely wowed him: countless carved effigies of colossal heads, chiselled and chipped from the black rock boulders of the land. In fact, there are over more than 880 of the so-called moai heads here, which are each thought to represent the final member of one of the tribal family clans. Set deep in the middle of the verdant lowlands of south-central England, where Salisbury Plain emerges in peaks and troughs of heath from the oak forests, Stonehenge has long oozed mystery and magic. Created an estimated 5,000 years ago, this circular conglomeration of huge megalith stones is thought to have been made with unique bluestone material that could only have been quarried from the Preseli Hills in Pembrokeshire, some 200 miles away in Wales. Mystery surrounds both how the Neolithic people managed to transport such huge rocks all that way, and as to the purpose of the building. Today, it’s wrapped up in Arthurian legends and attracts Pagans for the summer solstice. Uluru is the mighty pillar at the middle of the Australian Outback. It shoulders its way high above the flatlands that encompass it; a gargantuan block of sandstone rock that looks like the carapace of a petrified animal. A truly breathtaking place to behold, it attracts everyone from hikers to history buffs (who come mainly for the pre-historic petroglyphs that mark the caves nearby). However, Ayers Rock, as the site is also called, also figures as a focal point for the old traditions of the Australian Aborigines. They believe it’s one of the last remaining homes of the creator beings who forged the earth. Meanwhile, other folk come here to energise themselves at the fluvial channels that run underneath the rock – whatever that means!